Abnormal hormones caused by a thyroid issue are often blamed for hair loss, but there are relatively few cases of this actually occurring. Other factors may be at play, including the fact that hair loss is a facet of ageing, and that the hormones produced as a result of childbirth, menopause and the pressures of age can create hair loss. Genetics are also a major factor. However, hypothyroidism and hyperthyroidism can cause loss of hair. In cases of hair loss caused by these factors, the loss will affect the whole scalp and not just certain areas. In most cases, the hair looks sparse across the entire head, and the thyroid disorder has to be treated before the hair can grow back. It is rare for hair loss to happen in mild or short-lived cases, with prolonged hypothyroidism or hyperthyroidism being the most common causes. The hair loss will usually present after several months of the thyroid disorder taking effect. The delayed onset means the medication to treat the thyroid issue is often blamed and therefore discontinued, meaning the thyroid condition worsens along with the hair loss. Some anti-thyroid drugs, such as carbimazole and propylthiouracil can cause diffuse hair loss, although this is very rare. 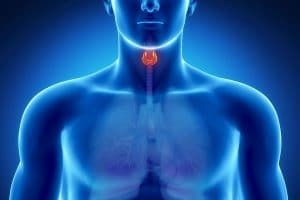 Most sufferers of thyroid disease will have autoimmune thyroid disease. Some hair loss conditions, such as Alopecia areata, are also autoimmune conditions which means that people suffering from autoimmune thyroid disease are more likely to suffer from hair loss as well. If you suffer from thyroid disease and you’re experiencing hair loss, you should visit Advanced Hair Studio right away. Your doctors will take care of your thyroid, but we can provide you with a range of solutions to expedite your hair growth. Men’s Therapies: Our men’s therapies have been designed by our hair loss doctors to treat all stages of balding and thinning hair. Each treatment has been through rigorous scientific testing, meaning our methods are proven. Women’s Therapies: Females suffering from thyroid-related hair loss will be pleased to know that we offer a range of treatments to counteract hair loss. You’ll be looked after by a hair loss expert who will be with you all the way from the consultation period to your treatment. Suffering from a thyroid disorder is hard enough, however, also dealing with hair loss is simply unfair. We’re here to help you sort out any hair loss issues, thereby ensuring your better equipped to fight the thyroid disorder. If you’re noticing your hair change and thin in front of your eyes. See us as soon as possible, the quicker we see you, the quicker you’ll get your hair and your enjoyment of life back. Get in touch with us at Advanced Hair Studio, and we’ll be able to determine just what you and your hair need. Hair loss can be reversed, we’ll show you how.